Everyone said we were crazy when we gave up our jobs (teaching and pharmaceutical sales) to open a winery. They were right in a way, because we are crazy about what we do. It all started with a trip to the Finger Lakes region of New York. There, we fell in love with grape growing and wine making. We decided to try it on our own here in the Pocono Mountains of Pennsylvania. So, we planted six varieties of grapes on our driveway’s split rail fence. When those 70 vines flourished, we cleared about four-acres of our six-acre property to plant a vineyard. It took about six years before we had enough grapes to start our business. 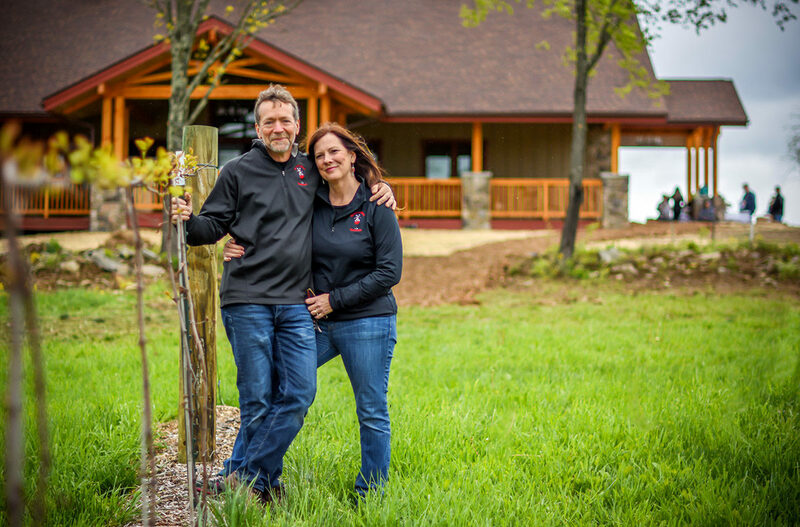 We opened our Pocono winery on September 1, 2009, our 20th Wedding Anniversary. We opened our Pocono distillery on Labor Day Weekend in 2013, the same weekend we celebrated the 4th anniversary of the winery and our 24th wedding anniversary. It’s been more than 15+ years since we planted our first few dozen vines. Now, we have a nearly 100-acre farm and thousands of vines in our vineyard. In May of 2017, we moved our business out of our home and into a beautiful new building. There’s at least four times as much space with a covered wrap around porch and stunning vineyard views. It’s been a wonderful labor of love and we truly appreciate all of our loyal customers who have made this such an amazing journey.